Lead is an indestructible heavy metal that can accumulate and linger in the body. Although the problem of lead exposure has been reduced in the United States, minorities and disadvantaged individuals remain chronically exposed. In developing countries, occupational and environmental exposures still exist and are a serious public health problem. Lead poisoning, or plumbism, is defined as a toxic condition caused by the ingestion or inhalation of the metallic element lead, which is found in many places, including the air, soil, water, houses, ceramic cookware, and solder used in metal cans and pipes. Lead poisoning occurs when blood lead levels are equal to or greater than 10 μg/dl (micrograms per deciliter). Lead exposure results from either inhaling or ingesting lead. Low levels of exposure (up to 10 μg/dl) are associated with anemia , headaches, general weakness, fatigue , learning disabilities, impaired development of the nervous system , and delayed growth, while greater levels of exposure (70 μg/dl) include symptoms such as decreased appetite, vomiting, abdominal pain, constipation , and drowsiness. If blood lead levels exceed 70 μg/dl, coma, seizures, bizarre behavior, impaired muscular coordination, and even death can occur. Lead poisoning is one of the greatest environmental threats to children. Lead absorption is five to eight times greater in children than in adults. Approximately 11 percent of ingested lead will reach the adult digestive tract, as compared to 30 to 70 percent in children. In addition, children absorb up to 50 percent of inhaled lead. Children that are at greatest risk are those living near highways and interstates, in urban and inner-city areas, or in low-income housing. While the United States government banned leaded gasoline in 1986, residual lead is still present in the soil around highways and interstates. Children that live in homes or play in playgrounds near those areas can ingest lead through dust on their hands. In developing countries where leaded gasoline is still used, children living near highways are exposed to lead through automobile and truck exhaust. Children living in inner-city and urban areas are exposed to lead through leaded paint used in older homes (prior to 1978), as well as through the presence of pipes soldered with lead solder. Lead can leach into the water in the pipes, contributing to the blood lead levels of children (and adults) ingesting the water. The major sources of lead exposure today are household dust from paint and exterior soil. In addition, children of low socioeconomic status are at a nutritional disadavantage, for they often do not consume enough food to keep their stomachs full enough to slow absorption, and because they usually do not have enough iron and calcium in their diets. In developing countries, both adults and children face a risk of lead poisoning due to exposure sources such as leaded gasoline, lead-based cosmetics, lead solder in food containers, ceramic cookware, folk remedies, and lead-based paint. Since adverse effects of lead poisoning are magnified in malnourished populations, it is critical that developing countries recognize the threat of unintentional lead exposure. 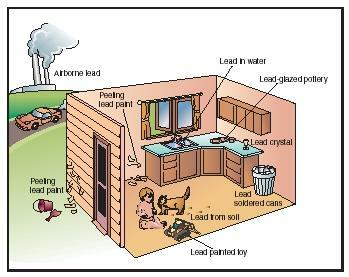 Lead is commonly found in and around the home, especially in older homes. Children are especially susceptible to lead poisoning, since they absorb lead more readily than adults. Even minor exposure to lead can severely affect a child's development. During the 1970s, Americans discontinued the use of leaded gasoline, and other sources of environmental lead exposure have gradually been reduced. While exposure to lead has diminished, residual amounts still remain in contaminated soil, dust, lakes, and streams. A major source of environmental exposure for children is lead-based paint. While this type of paint is no longer manufactured in the United States, buildings constructed prior to 1978 may contain residual lead. Lead exposure occurs when lead-contaminated dust is inhaled or ingested. In addition, young children may eat contaminated paint chips or ingest contaminated paint dust while sucking their hands or fingers. Other sources of lead exposure include ceramic cookware and lead solder. Lead contained in the glaze on ceramic cookware can leach out and enter food during the cooking process. In lead-soldered pipes, lead enters the water as it passes through or collects in the pipe. People living in older homes with lead-soldered pipes should drink bottled water or make certain that the water is allowed to run several minutes before it is ingested. Water that has sat in the pipes longer than six hours should not be consumed. While lead solder is no longer used to seal cans in the United States, imported food remains a source of exposure. Once again, lead from the solder leaches into the food. Acidic foods and drinks, such as pickles or fruit juice, enhance the leaching process. Other exposure sources include a food coloring ( lozeena ) from Iraq that is sometimes used to color rice and meat, and to which lead is sometimes added; prune juice concentrate from France and raisins from Turkey (lead-containing preservatives and pesticides are used on foods such as prunes and raisins), and duck eggs from Taiwan (lead is used in the traditional method of preserving duck eggs). In addition, a number of folk remedies from around the world, as well as imported leaded crystal, can be sources of lead exposure. Folk remedies of concern include: koo sar pills, used as a remedy for menstrual cramps in Asia; azarcon, an orange powder used for intestinal illness in Mexico; ghasard, an Indian folk remedy for babies; kandu, a red powder used to treat stomachache; farouk, a Middle Eastern teething remedy; and hai gen fen, a clamshell powder added to tea. Nutritional deficiencies allow lead to accumulate in body tissues and organs. The absorption of lead is greatest when the stomach is empty; therefore, consuming regular meals is important. Unfortunately, the ability to afford three meals a day is sometimes a problem for populations at risk for lead poisoning. In the body, calcium binds to lead and inhibits its absorption; therefore, dietary calcium interferes with the absorption of lead through the intestinal mucosa . Among high-risk populations, calcium supplements or the addition of milk and yogurt to meals and snacks is recommended. Research has also demonstrated a link between iron deficiency and lead poisoning. Recognition of this link is important, since iron deficiency is the most common childhood nutritional problem worldwide. Iron supplementation, or consuming foods rich in iron, such as fortified cereals, prunes, beef, and calves liver, can interfere with lead accumulating in the body. In many developed nations, information programs are available to advise homeowners of lead hazards in older homes. Programs offering proper methods of exposure reduction are important, since homeowners attempting to rid their homes of lead paint and pipes with lead solder can inadvertently increase their exposure through sanding and other activities. International groups, such as the World Health Organization, are working to increase international awareness of lead exposure issues and abatement programs. In 1998, the U.S. National Center for Environmental Health identified childhood lead poisoning as one of its five global priorities. The most effective intervention for lead poisoning is removing all sources of lead from the environment . Since this is not possible for many high-risk populations, health care providers can provide parents and child-care workers with information on how to care for children's nails and on proper hand-washing techniques, as well as information on the dangers of consuming paint chips and/or paint dust. Consumer-awareness campaigns relating to the potential hazards of imported cookware and dishes can also help adults and children avoid unintentional ingestion of lead. Individuals need to be aware of the potential presence of lead in products and food items from other countries, particularly those that lack environmental controls relating to lead, such as Mexico, Turkey, Pakistan, India, Indonesia, Nepal, Thailand, and many countries in the Middle East and Asia. As a result of public health initiatives, lead levels in children's blood have dropped steadily since the 1970s, but approximately 434,000 U.S. children between one and five years of age still have elevated lead levels. Lead poisoning remains a particular threat among certain racial and ethnic groups that are disproportionately affected. For example, 6 percent of white children living in older housing have elevated lead levels, while the numbers for African-American and Mexican-American children in similar housing are 22 percent and 13 percent, respectively. In developing countries, which commonly use unleaded gasoline, lead poisoning is the most significant environmental disease among children. According to the World Health Organization, fifteen to eighteen million children in the developing world have suffered permanent brain damage as a result of lead poisoning. Typically, persons diagnosed with blood lead levels greater than 45 μg/dl will receive chelation therapy, which uses chemical agents that bind to lead in the body and cause it to be excreted in the urine or feces. High blood lead levels are considered a medical emergency requiring immediate attention, since the chances of serious complications rise as lead accumulates in the blood. Alters, S., and Schiff, W. (2001). Essential Concepts for Healthy Living, 2nd ed. Boston: Jones and Bartlett. Binns, H.; Kim, D.; and Campbell, C. (2001). "Targeted Screening for Elevated Blood Lead Levels: Populations at High Risk." Pediatrics 108:1364–1366. Chisolm, J. J. (2001). "The Road to Primary Prevention of Lead Toxicity in Children." Pediatrics 107:581–583. Edlin, G.; Golanty, E.; and Brown, K. M. (1999). Health and Wellness, 6th ed. Boston: Jones and Bartlett. Ellis, M., and Kane, K. (2000). "Lightening the Lead Load in Children." American Family Physician 62:545–565. Lynch, R.; Boatright, D.; and Moss, S. (2000). "Lead-Contaminated Imported Tamarind Candy and Children's Blood Lead Levels." Public Health Reports 115:537–543. Nadakavukaren, A. (1990). Man and Environment: A Health Perspective, 3rd ed. Prospect Heights, IL: Waveland Press. Sargent, J. D. (1994). "The Role of Nutrition in the Prevention of Lead Poisoning in Children." Pediatric Annals 23:636–642. Satcher, D. (2000). "The Surgeon General on the Continuing Tragedy of Childhood Lead Poisoning." Public Health Reports 115:579–580. Simon, J., and Hudes, E. (1999). "Relationship of Ascorbic Acid to Blood Lead Levels." Journal of the American Medical Association 281:2289–2293. Telljohann, S.; Symons, C.; and Miller, D . (2001). Health Education: Elementary and Middle School Applications, 3rd ed. Boston: McGraw Hill. Tong, S.; Schirnding, Y; and Prapamontol, T. (2000). "Environmental Lead Exposure: A Public Health Problem of Global Dimensions." Bulletin of the World Health Organization 78:1068–1077. Warren, C. (2000). Brush with Death: A Social History of Lead Poisoning. Baltimore, MD: Johns Hopkins University Press. Whitney, E., and Nunnelley, E. (1987). Understanding Nutrition, 4th ed. New York: West Publishing. Wright, R.; Shannon, M.; Wright, R.; and Hu, H. (1999). "Association between Iron Deficiency and Low-Level Lead Poisoning in an Urban Primary-Care Clinic." American Journal of Public Health 89(7):1049–1053. i am a food technology student and now im currently work for an on job trainee in a food company here in the philippines in our experiment for some analysis in sugar in particular food product we used lead acetate both the powder and the liquid.. what should i do in order for me to minimized this kind of chemicals?? ?and what teatment in order to lessen the lead content that i inhaled during the analysis or some food suppleent?? ?